On July 11th, House Agriculture Committee Chairman Frank Lucas (R-OK) and member K. Michael Conaway (R-TX) tried to make the argument that the states of Texas and Oklahoma should be exempt from a provision that would limit federal subsidies to landowners who convert valuable wildlife habitat into cropland. By their logic, Texas and Oklahoma landowners deserve to receive taxpayer funds with no strings attached, even if they choose to destroy wildlife with that money. Wednesday, July 11th, the House Agriculture Committee sat for nearly 13 hours working through amendments to the Farm Bill. While the House bill maintained the same overall level of funding for conservation as the Senate’s version of the bill, it failed to protect grasslands across the country. Sodsaver limits federal subsidies for native grasslands that are broken out for farming. Although the House bill includes a sodsaver provision, it only applies to the Prairie Pothole Region. While the Prairie Potholes are an extremely important and imperiled region, especially for migratory birds, native grasslands are important habitat nationwide. Reps. Timothy Walz (D-Minn.) and Kristi Noem (R-S.D. ), along with Representative Jeff Fortenberry (R-Neb. ), offered an amendment that would extend this provision to the entire nation, protecting prairies throughout the country. However, the sponsoring members were forced to withdraw the amendment before the Committee could vote, due to strong opposition from Lucas and Conaway, who wished to exempt Texas and Oklahoma from sodsaver. To quote the Oklahoma Department of Wildlife Conservation, “Wildlife in Oklahoma belongs to the people of Oklahoma even though 95 percent of Oklahoma is privately-owned.” In other words, private landowners have a responsibility to everyone when it comes to wildlife conservation. Receiving federal funds is not a landowner’s right. My family owns farmland in Tennessee, and we don’t want anyone to tell us how we have to use it. But we also don’t expect the government to subsidize any initiative we undertake. Sodsaver does not take away the rights of landowners to convert grassland into cropland. It merely ensures that they do not receive taxpayer dollars for practices that harm the public. Yet Sodsaver ensures farmers are free to do whatever they wish with their land. Unbroken land is not in use because it is not the most productive cropland. Without federal incentives combined with high crop prices, it would not be put into use. However, when taxpayers subsidize the risk, landowners convert valuable wildlife habitat and rangeland into crops . According to the USDA, total cropland acreage increased across the US in 2012. In Texas, cropland increased by about 1.6 million acres from 2011 to 2012 – the second highest increase of any state. 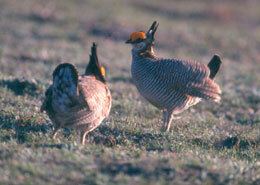 Texas and Oklahoma are both home to many grassland species. The Texas Parks & Wildlife has classified many grassland mammals, insects, birds, and plants as “species of greatest conservation need,” including the black-tailed prairie dog. Oklahoma crop acreage also increased in 2012 by approximately 600,000 acres. A national sodsaver provision is critical for protecting the habitat of grassland wildlife such as the Lesser Prairie Chicken, which is in danger of being listed as an endangered species and is part of conservation efforts in Oklahoma. Let Congress know you want the best wildlife protections included in the House Farm Bill.